Well friends, it's that time of year again, when my ice cold heart warms slightly and in an eggnog fueled stupor, I indulge in a little cute craft making. What can I say. 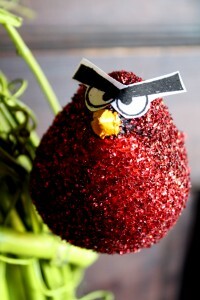 I love Angry Birds. I've never played it, but I love it. I love that it is on my phone and I can give the children my phone and have twenty minutes of quiet mommy time. I love that it's a game about throwing pigs, express bacon, what could be better? I like that it is "angry" not, plain old "pig toss" or "fussy birds" there is unabashed emotion here, cartoon characters not afraid to live out their inner id. They are angry and I can totally identify with that. If I wasn't the "Criminal Crafter" I might be the "Angry Crafter" because that suits me pretty well, except for right now, as I'm the "Deeply Amused and Pleased With Herself Crafter" as every time I look across the room and see my new wreath, I crack up, as the little beady eyes are glaring back at me. The whole project was a bit of a whim. I was at the thrift store last week and found a giant bag of small feathered birds for $3. Seeing anything with a bag over it's head makes me slightly uncomfortable, so I bought them just to let the poor fake beasties out of confinement. I gave them the usual treatment- anything that makes it's way into my house and isn't a food object, eventually will get glue gunned to something else frequently being covered in glitter 1st. I knew school glue and feathers probably wouldn't be a good match so I went with a light coat of spray adhesive and liberally applied the red glitter. My son acted as facial consultant, my prototype birds really weren't angry enough. I tried calling them names and mocking them, which didn't really work, so I just drew thicker eyebrows on the next birds and that seemed to work out just fine. 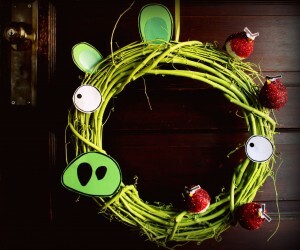 I had a grape vine wreath in the basement which gussied up quick with a thick coat of spray paint and I made the pig eyes and ears out of card-stock. 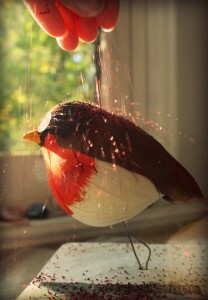 I've a number of birds left over so we'll be handing them off to special friends as Christmas gifts, which is perfect since I ate all the rum balls.